More classes, more riders…more fun! If a horse show class list has the word “ranch” in it, chances are that it has a growing number of entries. 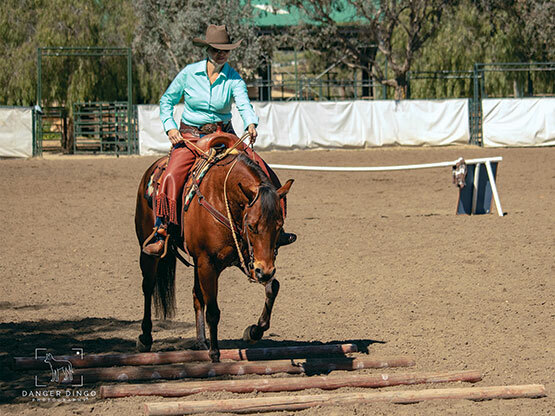 There are five different ranch riding classes now sanctioned by the American Quarter Horse Association, and they are frequently among the most popular at Southern California western shows. The explosion in popularity has multiple causes, not the least of which is that ranch riding rewards a solid, well-broke horse that shows most suitable for getting the job done on a working ranch—a horse that rides and works with purpose. After she earned four AQHA points at the All Breed Western Horse Show last fall in Del Mar for topping her 17-entry Novice Amateur Ranch Riding class, Birdie Avery shared why she moved over. The AQHA Versatility Ranch Horse competition promotes the athletic ability and versatility of the horse and is demonstrated in five classes – ranch riding, ranch trail, ranch reining, ranch cow work and ranch conformation. There are divisions for open, amateur, cowboy and youth, and all levels are embracing the classes. AQHA also has its Ranching Heritage Breeders program designed to recognize AQHA’s ranching members who have steadfastly continued to maintain the ranching tradition by raising Quarter Horses for working cattle. The pinnacle competition, the AQHA Ranching Heritage Challenge, highlights the versatility, soundness and willing attitude of Quarter Horses born and raised on a ranch. Last June’s record-setting 2018 show in Guthrie, Okla., had 2,575 entries for a combination of ranch riding events that were held at venue: the Zoetis Versatility Ranch Horse World Championships, the Zoetis AQHA Ranching Heritage Challenge Finals, the AQHA Level 1 Cattle Championships and the first national championships for the National Ranch and Stock Horse Alliance. People and horses were literally cross-entered in as many classes as they were qualified for. Versatility Ranch Horse entries alone at the championship show grew 66 percent from the previous year with nearly 60 entries in each of the VRH amateur, limited amateur and open ranch conformation classes. • Ranch Riding: For ranch riding classes, horses show individually, and the class can be conducted inside or outside an arena. Judges look for relaxed, responsive horses with soft, cadenced gaits, and timely transitions by the horse in a smooth, correct manner. The horse should be soft in the bridle and yield to contact. • Ranch Trail: Obstacles found in a ranch trail pattern are approximate to those found during the course of everyday work. Judges are looking for a well-trained, responsive and well-mannered horse that can correctly navigate and negotiate the course, and to do so in a correct and efficient manner. • Ranch Cow Work: When it comes to the ranch cow work class, riders have the choice between ranch cow work or limited ranch cow work for youth and amateur exhibitors, where riders are allotted one minute and thirty seconds to complete the work. There are four parts to the limited ranch cow work: boxing the cow; setting up the cow and driving it down the fence to the opposite end of the arena; boxing it at the opposite end of the arena; and drive the cow back down the fence past the middle marker. For ranch cow work, there are three parts to the class: boxing, fence work and roping or circling. The horse and rider must accomplish all three parts in three minutes. • Ranch Conformation: To be eligible to compete in the ranch conformation class, the horse must be shown in at least one class one of the other categories the day of the show. Judges are looking for balanced, structurally correct horses with adequate muscling. You’ll need to show your horse in a good working halter—rope, braided, nylon or plain leather—exhibit your horse at a walk and trot, then line up for inspection by the judge.